Giving Tree Coming on Sunday! 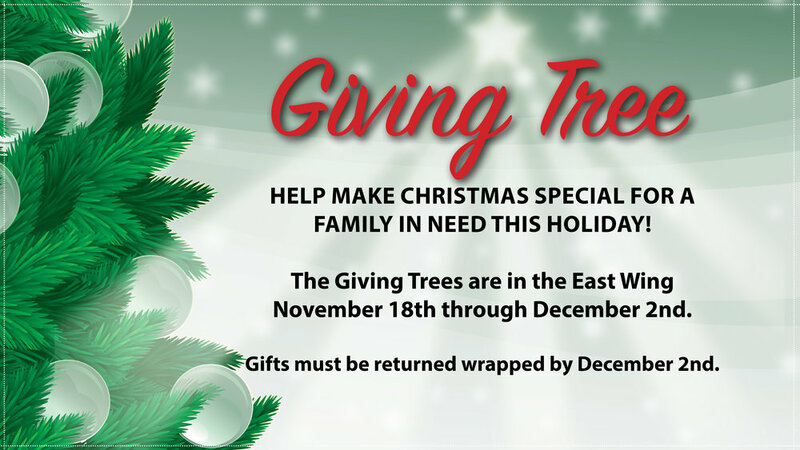 Christmas is right around the corner and our Giving Tree will be up in the East Wing beginning this Sunday, November 18. This will be your opportunity to select a card from the tree and provide a gift for those within and beyond our community. Gift cards on the tree will be available for 2 weeks, Nov. 18 – Dec. 2. This year your Church and Society Committee has decided to once again support Christmas Grace Program (under the Methodist Church’s Skyline Urban Ministries) and The Heifer Project. Christmas Grace provides Christmas gifts to families who register through Skyline. These families are screened and only allowed to participate every other year in this program. Our church will receive lists from several families and a card for each person will be placed on the tree. Price range will be $30-$50. Gifts need to be wrapped with Giving Tree cards attached. They are due back to the church on Dec. 2. The Heifer Project International is a non-profit organization dedicated to ending world hunger and poverty and caring for the earth. They provide livestock, trees, training and other resources to help struggling families build sustainable futures. Plus, each family who receives an animal agrees to give one of their animal’s offspring to another family. Our gift cards will allow you to make a contribution towards the purchase of an animal (the cards will reflect a range $10-$150, but any contribution will be welcome). We hope that our Giving Tree will not only provide a touch of Christ’s love to those outside of our church family but to those within our church family as well. This is a great opportunity to enrich your Christmas season. Thank you! If you have questions contact Janie Johnson at 396-2458. Newer PostWhat's a Punch Card? Older PostHave I Got a Deal for You!